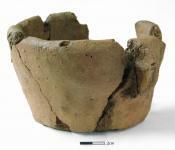 A previously unknown type of ceramic vessel was recovered from a site on the route of the N8 Mitchelstown Relief Road. Bruce Sutton excavated the site for Eachtra Archaeological Projects as part of a programme of testing and excavation undertaken on behalf of Cork County Council and the National Roads Authority. 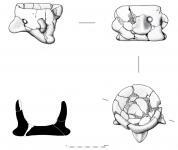 Three pottery vessels, including one decorated with eyes, nose, ears and feet and another with two ears, and a spoon were recovered from a small pit at the site in the townland of Mitchelstown in County Cork (NGR 180182, 113286; height 90 m OD; excavation licence no. 04E1071; ministerial direction no. A012/003). The decorated vessels do not have any known parallel in Ireland or Britain. The landscape surrounding the site is dominated by the Galtee Mountains to the north, the Ballyhoura Mountains to the west and the Kilworth Mountains to the south, and the area is drained by the River Funshion and its tributaries, including the Gradoge River. The site is found on the northern bank of the Gradoge, the course of which has been altered in the recent and historic past. It is c. 1.5 km to the west of Mitchelstown, within the historic Mitchelstown Demesne where some 1,240 acres of parkland was created in the 18th century. The land in the vicinity of the site is now, for the most part, under pasture. An area 50 m north–south by 20 m was excavated on the northern bank of the river. The excavated features comprised a layer of heat-shattered stone and charcoal, three pits, a stake-hole and part of a former channel of the river. The burnt mound layer comprised of black sandy silt with frequent inclusions of burnt sandstone. It measured 9.5 m by 1.66 m and was 0.25 m in depth. It was truncated to the south by the former river channel. Two small pits were recorded under the burnt spread. The westernmost pit measured 0.28 m by 0.2 m and was 0.18 m in depth. The second pit was located 2.5 m to the east. It measured 0.15 m in diameter and was 0.14 m in depth. Both pits contained single fills with no inclusions. The former river channel was located c. 10 m to the north of the present course of the Gradoge River. It was traced within the excavated site for a length of 13 m and measured 2.5 m in width by 1.6 m in depth. The ground between the former channel and the present course of the river was disturbed in the recent past by agricultural activities. A pit and stake-hole were located c. 13 m to the north of the other features on the edge of the excavation. Their relationship to the burnt mound material and the two small pits is not clear. The stake-hole was located 1.1 m north of the pit; it measured 0.2 m in diameter and 0.19 m in depth. The pit measured 0.6 m by 0.5 m and was 0.3 m in depth. 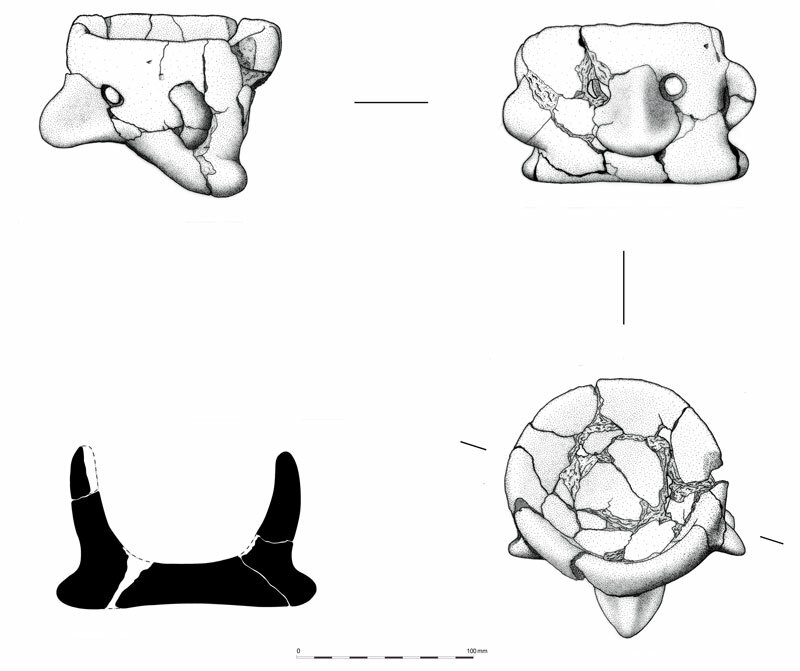 Three shallow fills were recorded within the pit and a radiocarbon date of 1916–1696 BC (UB-6743; see Appendix 1 for details) was returned from oak charcoal recovered from its upper fill. Two flat stones had been placed at the base of the pit and three pottery vessels had been placed upon these. These were accompanied by another ceramic artefact identified as a spoon. The pottery was examined by pottery experts Dr Eoin Grogan and Helen Roche and was identified ‘as an exceptional assemblage, both for the unusual and sequential deposition of the pottery without clear burial evidence and for the nature of the vessels: Vessel 1of the cordoned urn tradition is quite small and unusually fine walled while Vessels 2 and 3 have no parallels in Ireland.’ Grogan and Roche suggested that two distinct phases of deposition took place in the pit. The depositions may have happened within a short space of time as no evidence for a re-cut of the pit was recorded during the excavation. Vessel 1, a Cordoned Urn, was initially deposited in the western portion of the pit in an upright position on a flat stone on the base of the pit. The vessel is typical of those containing Cordoned Urn burials but no cremated bone was recovered from the pit. Two additional vessels were placed upright in the pit, resulting in damage to Vessel 1, which was recovered in many pieces. Vessel 2 is a handled and footed face-mask cup and was deposited centrally in the pit apparently at the same time as Vessel 3. The diameter of the rim measures 120 mm and the internal depth is 70 mm. 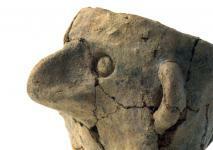 It is decorated with a handle or nose, eyes, lugs or ears and two protruding feet. The close position of the ears and nose on one side of the vessel creates a weight imbalance and means that the vessel cannot stand upright. The vessel is possibly moulded from a single lump of clay and was well fired. 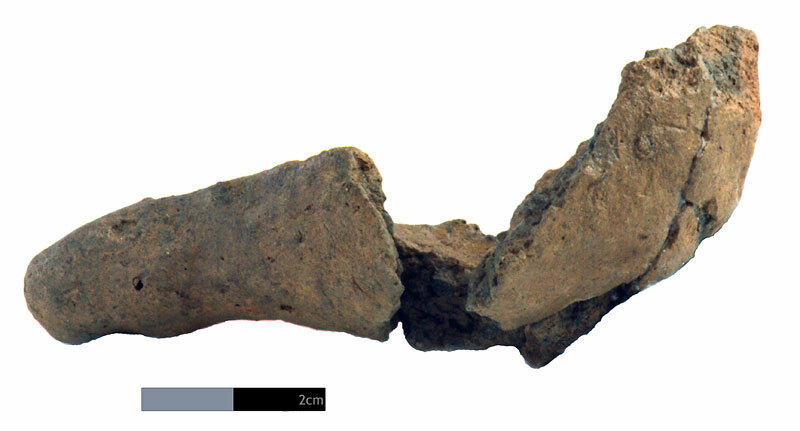 Vessel 3 is a tub-shaped pot and was deposited upright and intact on the eastern side of the pit beside Vessel 2. The diameter of the rim measures 130 mm and the internal depth is 70 mm. The pot is decorated with a pair of lugs or ears. They are the same design as those on Vessel 2, being solid quarter rounds with a slight internal ridge. The ears are placed in opposite directions on both vessels and the fabric of the vessels is similar. The placement of Vessels 2 and 3 together would suggest that they were made as a pair. As noted previously, there are no known Irish parallels for Vessels 2 and 3. The original position of the spoon within the pit is not known as its bowl was broken into several fragments as found. The spoon measures 96 mm in length and the internal depth of the bowl is 20 mm. The deposition of three Early Bronze Age pottery vessels in a small pit is a rare and highly significant find. The pots were placed upon two flat stones that lay within the base of the cut on a bed of sandy material. The placing of the pottery vessels within the pit indicates a symbolic and ritual deposit. There are 16 Bronze Age burials, comprising cist burials, Food Vessel burials, Urn burials and pit burials, recorded within a 13 km radius of the site. The burials are generally located on low-lying ground between 60 m and 100 m OD. Some are located within 500 m of the Funshion River and its tributaries, the Sheep River, the Tooraleagan River and the Gradoge River. Generally, Early Bronze Age burials tend to be concentrated in low-lying areas such as valley floors, while the associated settlement sites are probably located on higher ground along the valleys (Cooney & Grogan 1999, 103). While the majority of graves contain the remains of one individual, multiple burials, either collective or successive, also occurred. The majority of the Cordoned Urns are associated with burials and the simple pit grave is the commonest type (Waddell 2000, 149). The Mitchelstown pit and pottery group shares some characteristics of Early Bronze Age burial practices in terms of the low-lying location in the river valley, the simple form of the pit itself, and the deposition of the Cordoned Urn. However, many aspects are very different. The creation of a face and human features on Vessels 2 and 3, the positioning of the ears, anatomically incorrect, on both vessels and the inclusion of a spoon are all unusual. In addition, despite the inclusion of a Cordoned Urn—usually a funerary vessel, there was no evidence of burial recorded at the site. The deposition therefore points away from burial and towards other ritual, for instance libation to a deity. It is also possible that this pit does not exist in isolation and other archaeological features, including burials, may be located in the area to the west, beyond the edge of the road corridor. Thanks to the excavation and post-excavation team and to Dr Eoin Grogan, Helen Roche, Penny Johnston and Abigail Brewer for specialist work. Maps are by Enda O’Mahony, artefact photography by John Sunderland and artefact drawings by Fiachra Dunne.